From the School of Pharmacy and Department of Neurology (B.E.G. ), University of Wisconsin, Madison; Idaho Comprehensive Epilepsy Center (R.T.W. ), Boise; David Geffen School of Medicine at UCLA (R.S. ), University of California-Los Angeles; School of Medicine (G.D.M. ), Boston University, MA; School of Pharmacy (H.S.W. ), University of Washington, Seattle; Center for Orphan Drug Research (J.C.C. ), College of Pharmacy, University of Minnesota, Minneapolis; Prescott Medical Communications Group (M.C.K. ), Chicago, IL; and Lundbeck LLC (G.P., D.M.T., V.S., J.I. ), Deerfield, IL. Objective: To evaluate potential development of tolerance to adjunctive clobazam in patients with Lennox-Gastaut syndrome. Methods: Eligible patients enrolled in open-label extension study OV-1004, which continued until clobazam was commercially available in the United States or for a maximum of 2 years outside the United States. Enrolled patients started at 0.5 mg·kg−1·d−1 clobazam, not to exceed 40 mg/d. After 48 hours, dosages could be adjusted up to 2.0 mg·kg−1·d−1 (maximum 80 mg/d) on the basis of efficacy and tolerability. Post hoc analyses evaluated mean dosages and drop-seizure rates for the first 2 years of the open-label extension based on responder categories and baseline seizure quartiles in OV-1012. Individual patient listings were reviewed for dosage increases ≥40% and increasing seizure rates. Results: Data from 200 patients were included. For patients free of drop seizures, there was no notable change in dosage over 24 months. For responder groups still exhibiting drop seizures, dosages were increased. Weekly drop-seizure rates for 100% and ≥75% responders demonstrated a consistent response over time. Few patients had a dosage increase ≥40% associated with an increase in seizure rates. Conclusions: Two-year findings suggest that the majority of patients do not develop tolerance to the antiseizure actions of clobazam. Observed dosage increases may reflect best efforts to achieve seizure freedom. It is possible that the clinical development of tolerance to clobazam has been overstated. ClinicalTrials.gov identifier: NCT00518713 and NCT01160770. Classification of evidence: This study provides Class III evidence that the majority of patients do not develop tolerance to clobazam over 2 years of treatment. Tolerance to antiepileptic effects has been suggested for a variety of AEDs,4,5 most commonly benzodiazepines,6,7 with variable and unpredictable timing that limits their clinical use.2,7 One putative mechanism of benzodiazepine tolerance is downregulation of γ-aminobutyric acid (GABA) receptors following prolonged exposure; however, tolerance has been observed in the absence of receptor changes, and evidence has been mixed.8,–,10 While there is substantial evidence from preclinical animal models demonstrating the development of tolerance,11,–,15 extrapolation of these observations to the clinical setting is not straightforward. Differences in experimental design, seizure model, and species selection may contribute to variability between studies and may limit extrapolation to humans.2 Moreover, it is possible that human patients do not exhibit tolerance to benzodiazepines at the same rates observed in laboratory animals. Whether tolerance actually occurs in patients is a clinically important question in the long-term treatment of epilepsy. There is a paucity of contemporary, controlled clinical trials with well-defined criteria and outcome measures that would resolve this issue. Tolerance with resultant loss of clinical effect may not occur in all patients; therefore, analysis of individual response, a feature lacking in many earlier studies, is also critical. Furthermore, it is possible that benzodiazepines with differing chemical structures or receptor affinities may display differing patterns of tolerance, should it exist. The objective of the present study was to construct a rigorous analysis of clobazam (ONFI, Lundbeck, Deerfield, IL), a 1,5-benzodiazepine indicated in the United States for the adjunctive treatment of seizures associated with Lennox-Gastaut syndrome (LGS) in patients ≥2 years of age,16 in a well-defined population of patients derived from prospective, randomized, controlled clinical trials. These post hoc analyses used data collected during a phase 3 lead-in study, OV-1012,17 and an open-label extension (OLE) study, OV-1004.18 To examine tolerance, we used 3 analytic approaches: group mean changes in seizure rates and dosage based on responder categories, group mean changes in seizure rates and dosage as a function of baseline seizure frequency because baseline seizure frequency may affect the development of tolerance, and individual mean changes in seizure rates and dosage because group analysis may obscure changes occurring in only a subset of patients. Patients were eligible to participate in the lead-in study (OV-1012) if they were between 2 and 60 years of age with a diagnosis of LGS (onset <11 years of age), weighed ≥12.5 kg, and received stable dosages of 1 to 3 AEDs (except benzodiazepines) for ≥30 days. Patients who met the following criteria were eligible to enroll in the OLE study (OV-1004): completion of lead-in study OV-100219 (data not used in these analyses) or OV-1012; <14 days since the last dose of study drug in lead-in study; no adverse events or serious adverse events probably or definitely related to clobazam as judged by the investigator; and receipt of ≤3 concomitant AEDs, including vagus nerve stimulation and ketogenic diet. However, receipt of >3 concomitant AEDs was permitted after enrollment in the OLE. Both the lead-in study (NCT00518713) and OLE study (NCT01160770) were approved by an independent ethics committee or institutional review board at each study site, and each patient (or parent/caregiver) provided written informed consent. The lead-in OV-1012 was a multicenter, randomized, double-blind, placebo-controlled, parallel-group study. It comprised a 4-week baseline period, a 3-week titration period, and a 12-week maintenance period. The OLE study continued until clobazam (dosing described below) was commercially available in the United States (maximum 6 years) or for a maximum of 2 years outside the United States. During the OLE, clobazam was administered twice daily. Enrolled patients (n = 267) were started at 0.5 mg·kg−1·d−1, not to exceed 40 mg/d. This dosage was maintained for 48 hours; then dosages could be adjusted up to 2.0 mg·kg−1·d−1 (maximum allowed dosage 80 mg/d) on the basis of efficacy and tolerability. To optimize patient care, investigators were allowed to start, adjust, or discontinue other seizure treatments, including vagus nerve stimulation and ketogenic diet. Three separate post hoc analyses were conducted to examine tolerance. Changes in weight-adjusted mean dosages (milligram per kilogram per day) were evaluated over the first 2 years of the OLE trial on the basis of patient responder categories in lead-in study OV-1012 (100%, ≥75%, 50%–<75%, 25%–<50%, or <25% reduction in weekly drop-seizure rates vs baseline). Mean weekly drop-seizure rates over 24 months were examined in patients with 100% or ≥75% reductions during the lead-in study. In a second analysis, changes in weight-adjusted mean dosages (milligram per kilogram per day) by baseline seizure quartiles in lead-in study OV-1012 (<10, 10–31, 32–110, or 111–1,147 drop seizures/wk at baseline) were examined. Mean weekly drop-seizure rates over 24 months also were examined in patients on the basis of baseline seizure quartiles during OV-1012. Finally, individual patient listings were reviewed for evidence of dosage increases ≥40% (based on weight-adjusted dosages [milligram per kilogram per day]) and for a loss of response based on seizure rates at the end of the follow-up period (i.e., 100% responders at the end of OV-1012 but not seizure free at the 24-month mark of OV-1004, 75% responders with a seizure reduction <75%, 50% responders with a seizure reduction <50%). A dosage increase of ≥40% plus loss of response was defined as tolerance for individual patients. This post hoc analysis of data from a lead-in and an OLE study provides Class III evidence that the risk of developing tolerance to clobazam was low over the 2 years of treatment observed here. Responder rate data from OV-1012 were available for 200 patients, who therefore were included in the post hoc analyses. 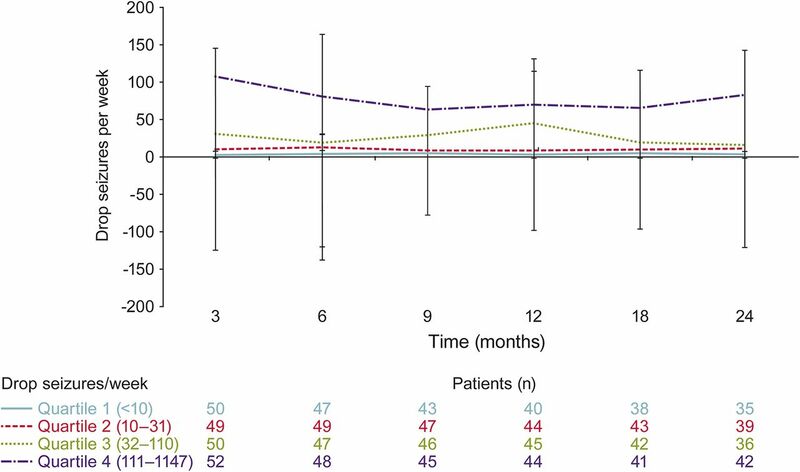 There was no notable change in dosage over 24 months for patients who were free from drop seizures (figure 1). All other drop-seizure responder groups (i.e., ≥75%, 50%–<75%, 25%–<50%, <25%) had notable increases in dosage over time (figure 1). Most increases were observed during the first 9 to 12 months; dosages remained relatively stable thereafter until the end of follow-up (24 months). Weekly drop-seizure rates for the 100% and ≥75% responder groups demonstrated a consistent response over time (figure 2). 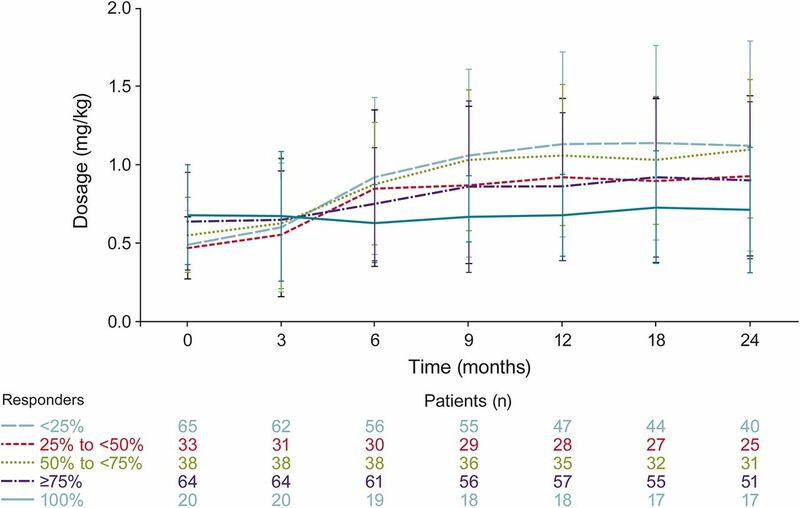 When analyzed by baseline seizure quartiles, patients who experienced <10 weekly seizures at baseline had the least change in dosage over time (figure 3). Mean dosages by baseline seizure quartiles showed that patients in the second, third, and fourth quartiles had progressively greater increases in dosage over time (figure 3). However, patients had consistent mean weekly drop-seizure frequencies without a notable increase in seizures over the course of the 24-month analysis (figure 4). Individual patient data were reviewed for dosage increases ≥40% correlated with decreased seizure control, as measured by change in responder category (e.g., the return of drop seizures in patients who had previously been free of drop seizures). This was found in a minority of patients (table 1). Individual patient results are presented in table e-1 at Neurology.org. It is well recognized that the complex pharmacology and pharmacokinetics of the available AEDs can confound the treatment of epilepsy. Among the many uncertainties that clinicians face when selecting an AED, it is possible that an initially robust clinical response to a treatment will diminish over time. In other words, pharmacodynamic tolerance may contribute to AED failure in some patient populations. There are many ways that tolerance may be defined in the clinical epilepsy setting. Most commonly, it is thought of as a shift in responder status from those with ≥50% reduction in seizures to <50% reduction in individual patients.2 Retrospective studies evaluating tolerance to clobazam in the clinical setting have suggested that tolerance may occur at rates between 7% and 48% in patients over a 1- to 2-year observation period.20,–,22 Recognizing the potential limitations of extrapolating data derived from experimental animal models and retrospective patient studies using uncontrolled observations, we constructed our analysis to identify loss of seizure control while minimizing the influence of confounding factors. First, overall groups were examined for loss of seizure control (increasing drop seizures) and increasing dosages on the basis of responder status. Furthermore, it is possible that the development of functional tolerance, as opposed to pharmacokinetic tolerance, may be influenced by baseline seizure frequency; therefore, a second analysis examined changes in seizure frequency and dosage in patient groups identified by baseline seizure quartiles. Finally, while group response can detect loss of seizure control over time, it may obscure the development of tolerance within a unique subgroup.2 That is, if some patients have improved seizure control while other patients have a loss of seizure control, mean data may remain similar despite the loss of effect in some patients. Therefore, a third analysis of individual patient data was used to detect potential shifts in responder status (i.e., 75% responder to 50% responder) even if this were to occur in only a subset of patients.2 With these 3 approaches, evaluation of long-term data in patients with LGS suggests that there is no substantive evidence for the development of tolerance to clobazam over 2 years. Previous literature has suggested that tolerance to benzodiazepines may develop anytime from after a few days of treatment23 to 18 months of long-term therapy,24 with the majority of reports indicating that tolerance developed within 1 to 6 months of continuous benzodiazepine therapy. In the present analysis, seizure rates were consistent for groups on the basis of responder categories and baseline seizure quartiles, indicating no loss of response over 2 years of clobazam treatment. 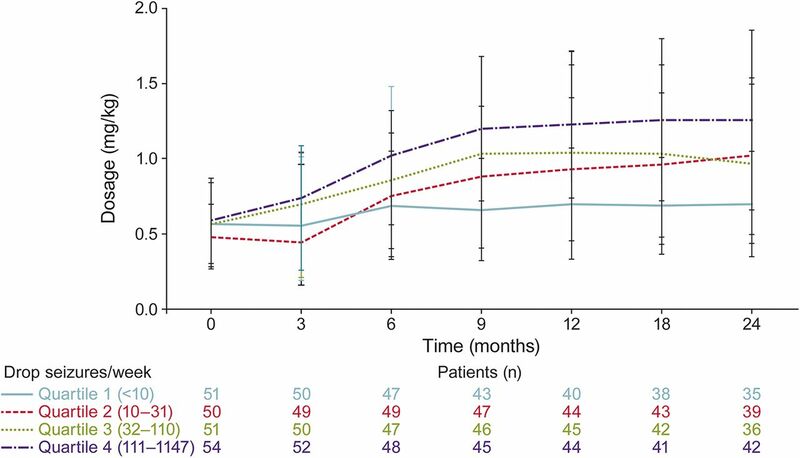 Mean dosage increases observed during the first 12 months seem to reflect best practices in an effort to achieve the clinical goal of seizure freedom rather than tolerance to clobazam treatment. In addition to group analysis, review of individual patient dosages and seizure rates indicated that the vast majority of patients did not develop tolerance to clobazam. A noticeable drop in patient retention rates was observed between 2 and 3 years, but this drop was driven by sites outside the United States where patients were able to remain in the study for only 2 years.25 Because the majority of patients were allowed to remain in the OLE trial for 2 years, the time frame of this analysis was adequate to evaluate the potential onset of tolerance with long-term clobazam administration. Our analysis was not designed to address the issue of tolerance (or lack thereof) to adverse events associated with clobazam treatment. This is an interesting yet mechanistically different question. Bateson1 theorized that distinct mechanisms may underlie different therapeutic effects and tolerance seen with benzodiazepine treatment based on the differing time courses of these effects. For example, tolerance to the sedative effect occurs more rapidly than tolerance to the antiseizure effect, and tolerance to the anxiolytic effect occurs slowly. Bateson1 suggested that prolonged agonism at the GABA receptor leads to desensitization that finally results in uncoupling, a mechanism that could account for the differential time course of effects. Clearly, the potential for any patient to develop tolerance to an AED is an important clinical concern. Although diminished therapeutic response appears to be infrequent, this analysis demonstrates that, whether a result of pharmacologic tolerance or evolving disease state, it can still occur in some patients. Indeed, although loss of efficacy over time (i.e., tolerance) is most commonly associated with benzodiazepine treatment, it also has been noted clinically with other structurally and mechanistically diverse AEDs.4,5 Unfortunately, no predictive factors that might lead to eventual pharmacologic tolerance were identified. Future investigations directed toward more detailed individual patient analysis, likely at the genomic level, are certainly warranted. Because of the impracticality of a longitudinal, monotherapy analysis in this patient population, the methodology used here may provide unique insights into the potential development of tolerance to clobazam in the clinical setting. For now, our observations suggest that the development of clinical tolerance to clobazam may be overstated and that this agent may provide a valuable long-term option for patients with LGS. B.E. Gidal was responsible for study concept and design, data interpretation, and drafting the manuscript. R.T. Wechsler, R. Sankar, G. Montouris, H.S. White, and J.C. Cloyd were responsible for analysis and interpretation of data and editing of the manuscript. M. Kane was responsible for drafting and editing of the manuscript, including creating tables and figures, incorporating all author comments, and formatting the manuscript for submission. G. Peng, D.M. Tworek, V. Shen, and J. Isojarvi were responsible for analysis and interpretation of data and editing of the manuscript. All authors have approved the final manuscript for submission. Funding for this project and for original clinical trials was provided by Lundbeck LLC, Deerfield, IL. B. Gidal has received honoraria for speaking engagements from UCB, Eisai, and Sunovion and for consulting from UCV, Eisai, Sunovion, Upsher-Smith, Lundbeck, and SK-Bioscience. R. Wechsler has participated in clinical trials for Alexza, Eisai, GW, Lundbeck, Marinus, SK Life Science, Sunovion, UCB, Upsher-Smith, and Vertex; has provided consulting services and/or participated in scientific advisory boards for Eisai, GW, Lundbeck, Sunovion, UCB, and Upsher-Smith; and has received honoraria for speaking engagements from Eisai, Cyberonics, Lundbeck, Sunovion, and UCB. R. Sankar has received grants or research support from NIH/National Institute of Neurological Disorders and Stroke, Pfizer, and Acorda; has received honoraria or consultation fees from UCB, Lundbeck, Supernus, Upsher-Smith, Eisai, and Cyberonics; and has participated in speakers’ bureaus for UCB, Lundbeck, Supernus, Eisai, and Cyberonics. G. Montouris has served on scientific advisory boards for Acorda Therapeutics, Upsher Smith, and Lundbeck and is a member of the Expert Panel UCB Pregnancy Registry. H. White has received consulting honoraria from Upsher-Smith, Lundbeck, and Takeda; has received grant support from the National Institute of Neurological Disorders and Stroke and NIH; has received other support from Citizens United for Research in Epilepsy; and is a scientific cofounder of NeuroAdjuvants, Inc, Salt Lake City, UT. J. Cloyd has received grant support from NIH/National Institute of Neurological Disorders and Stroke, Citizens United for Research in Epilepsy, the Epilepsy Foundation, the American Epilepsy Society, Paralyzed Veterans of American, Pfizer, and Genzyme; has received royalties from Ligand Pharmaceuticals; and has served as a consultant for Upsher Smith Laboratories, UCB, Lundbeck, Eisai, Epalex, and Xeris Pharmaceuticals. M. Kane is an employee of Prescott Medical Communications Group, Chicago, IL. G. Peng and J. Isojarvi were employees of Lundbeck LLC, Deerfield, IL, at the time the analyses were conducted. D. Tworek and V. Shen are employees of Lundbeck LLC, Deerfield, IL. Go to Neurology.org for full disclosures. Go to Neurology.org for full disclosures. Funding information and disclosures deemed relevant by the authors, if any, are provided at the end of the article. The Article Processing Charge was paid by Lundbeck, LLC. Accepted in final form July 11, 2016.
. Basic pharmacologic mechanisms involved in benzodiazepine tolerance and withdrawal. Curr Pharm Des 2002;8:5–21.
. Experimental and clinical evidence for loss of effect (tolerance) during prolonged treatment with antiepileptic drugs. Epilepsia 2006;47:1253–1284.
. Mechanisms underlying tolerance after long-term benzodiazepine use: a future for subtype-selective GABA(A) receptor modulators? Adv Pharmacol Sci 2012;2012:416864.
. Transient improvement after brief antiepileptic drug withdrawal in the epilepsy monitoring unit: possible relationship to AED tolerance. Epilepsia 2010;51:811–817.
. Loss of the initial efficacy of levetiracetam in patients with refractory epilepsy. Seizure 2013;22:185–188.
. Benzodiazepines in the treatment of epilepsy: a review. Epilepsia 1973;14:277–310.
. Current status of the 1,4- and 1,5-benzodiazepines in the treatment of epilepsy: the place of clobazam. Epilepsia 1986;27(suppl 1):S27–S41.
. Down-regulation of benzodiazepine binding to alpha 5 subunit-containing gamma-aminobutyric acid(A) receptors in tolerant rat brain indicates particular involvement of the hippocampal CA1 region. J Pharmacol Exp Ther 2000;295:689–696.
. Comparison of anticonvulsant tolerance, crosstolerance, and benzodiazepine receptor binding following chronic treatment with diazepam or midazolam. Pharmacol Biochem Behav 1994;48:765–772.
. Benzodiazepines in epilepsy: pharmacology and pharmacokinetics. Acta Neurol Scand 2008;118:69–86.
. Benzodiazepine cross-tolerance in mice extends to sodium valproate. Eur J Pharmacol 1986;128:9–15.
. Tolerance to the anticonvulsant effect of clorazepate and clonazepam in mice. Pharmacol Toxicol 1988;62:38–41.
. Tolerance to anti-pentylenetetrazol effects following chronic diazepam. Eur J Pharmacol 1986;121:281–284.
. Tolerance to the anticonvulsant effects of carbamazepine, diazepam, and sodium valproate in kindled rats. Pharmacol Biochem Behav 1992;41:109–113.
. Development of tolerance to the anticonvulsant effect of diazepam in dogs. Eur J Pharmacol 1984;104:27–38. ONFI [package insert]. Deerfield, IL: Lundbeck LLC; 2011.
. Randomized, phase III study results of clobazam in Lennox-Gastaut syndrome. Neurology 2011;77:1473–1481.
. 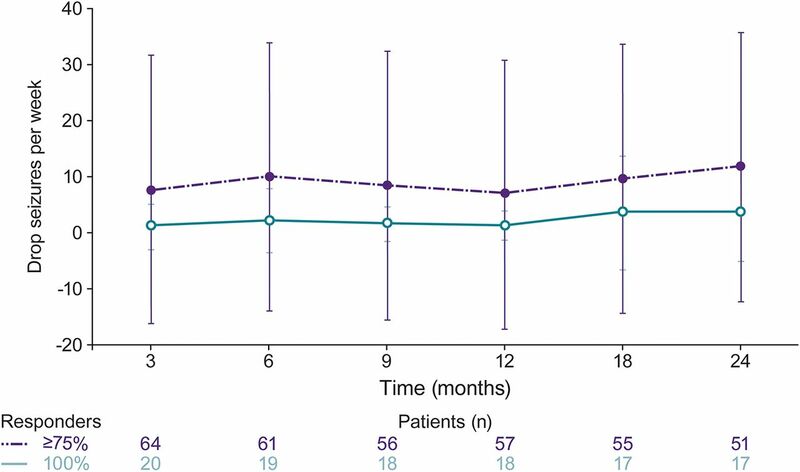 Stable dosages of clobazam for Lennox-Gastaut syndrome are associated with sustained drop-seizure and total-seizure improvements over 3 years. Epilepsia 2014;55:558–567.
. Clobazam in the treatment of Lennox-Gastaut syndrome. Epilepsia 2009;50:1158–1166. Clobazam has equivalent efficacy to carbamazepine and phenytoin as monotherapy for childhood epilepsy: Canadian Study Group for Childhood Epilepsy. Epilepsia 1998;39:952–959.
. Effectiveness and tolerance of clobazam in temporal lobe epilepsy. Acta Neurol Scand 1996;93:88–93.
. Long-term use of clobazam in Lennox-Gastaut syndrome: experience in a single tertiary epilepsy center. Clin Neuropharmacol 2013;36:4–7.
. Clinical, electroencephalographical and neuropharmacological studies in syndromes of progressive myoclonus epilepsy. Acta Neurol Scand 1970;46:149–186.
. A new anticonvulsant in the management of minor motor seizures. Dev Med Child Neurol 1972;14:3–14.
. Long-term safety and efficacy of clobazam for Lennox-Gastaut syndrome: interim results of an open-label extension study. Epilepsy Behav 2012;25:687–694.
. Clobazam and clonazepam use in epilepsy: results from a UK database incident user cohort study. Epilepsy Res 2016;123:68–74.
. Clobazam and its active metabolite N-desmethylclobazam display significantly greater affinities for α2- versus α1-GABAA–receptor complexes. PLoS One 2014;9:e88456.